Even if you don’t follow anime or manga, chances are you’ve heard of Eiichiro Oda’s One Piece - having gotten its start in 1997 and still going strong today, this long-running tale of the Straw Hat crew’s far-reaching, seafaring adventures in piracy has blossomed into one of Japan’s most popular exports. With such wide appeal, it should come as no surprise that it’s also had quite a few video game adaptations over the years, including several titles of varying standards on the 3DS. 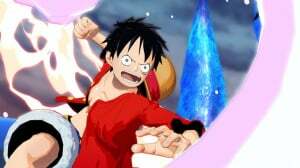 The latest One Piece release, Unlimited World Red, falls on the right side of that quality spectrum, and while it’s not without issues, it still serves up a fun adventure for series fans. 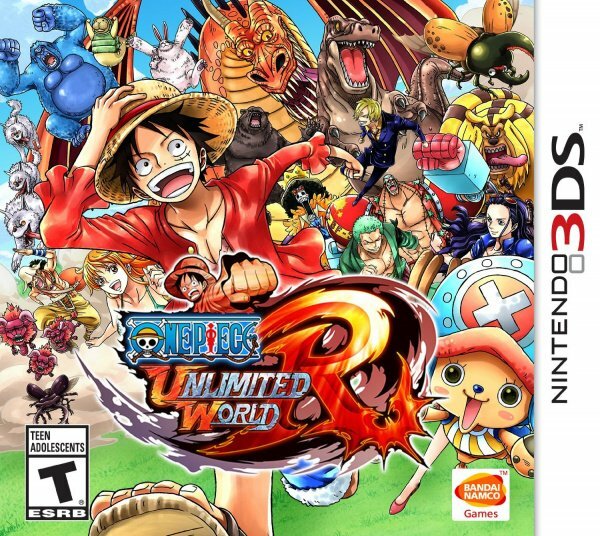 Like many One Piece arcs, the story of Unlimited World Red picks up at sea. Luffy and the gang have finally spotted the Island of Promises, where they plan to part ways with their new friend Pato, a tanuki with the power to draw objects into existence on his magical leaf. But all’s not well when they set foot on land; as soon as Luffy heads into Transtown port to see the sights and grab a bite, his friends end up kidnapped, and so he sets out to rescue the rest of the crew and find out the truth behind the mysterious island. Since you’re essentially jumping into the middle of an ongoing story, don’t expect much in the way of background, world-building, or backstories — Unlimited World Red assumes familiarity with the series, and doesn’t give you much help in getting caught up to speed. This isn’t a huge problem in terms of plot — you’ll miss out on references and nuances, of course, but you’ll certainly get the gist — but it’s a shame newcomers aren’t given a better introduction to the characters. The Straw Hat crew is full of wonderfully bizarre, over-the-top, and ultimately lovable personalities, with genuinely interesting histories, motivations, and powers, but without having followed their adventures in other media, or reading up on them beforehand, you’d never know it — at least not at first. Once you hop into the adventure, Transtown acts as the game’s central hub. From there you can travel to various self-contained stages, first tracking down your kidnapped companions and then chasing after the unmasked villain with the whole gang. Each largely linear stage holds plenty of foes to beat up, loot to grab, and a boss to defeat, and you can use the spoils you pick up on your journey to expand Transtown’s shops and offerings when you return, before heading out once again, powered-up and ready to go. It’s a comfortable, classic loop, and Transtown is a fun, well-realized hub — using Luffy’s elastic arms to swing around the town like a shōnen Spider Man is a real treat. You’ll explore the levels themselves in groups of three — at least, as soon as you rescue a few friends — and you can switch between characters on the fly with a quick tap on the touch screen. 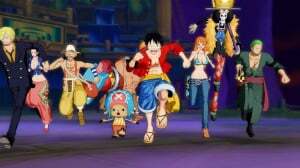 Each pirate plays very differently; Luffy fights with his rubber limbs, Zoro wields a pair of katanas, Nami carries a long staff and controls lightning, Robin raises extra limbs from out of the earth(! ), and Chopper shape-shifts into various anthropomorphic reindeer forms to beat up on foes; these are just few of the fighters available. 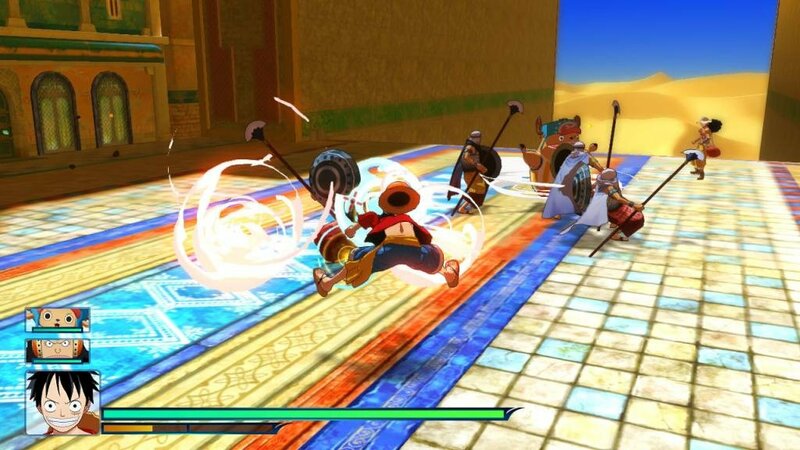 Each character’s weapons and personal powers may be different, but as a whole the combat system places a large emphasis on combos, and by tapping the ‘X’ and ‘Y’ buttons in different patterns you can unleash dozens of different attacks. There really are a lot of ways to wail on enemies, and a distinction between short and longer button presses adds in another layer of nuance — once you wrap your head around it all, you’ll be able to fly around the battlefield with ease, juggling short- and long-distance attacks with throws, special moves, and screen-clearing tag-team partner attacks, the latter two of which drain your fast-recharging SP meter. Combat certainly feels good, but — for better or for worse — it’s generally pretty easy; perhaps taking thematic cues from the source material, Luffy and the gang feel massively overpowered compared to the average enemy grunt. QTE-style prompts let you avoid taking damage from most attacks and follow up with punishing counters, and your AI-controlled teammates don’t ever lose health — they’re also surprisingly capable, to the point where most fights can be won even if you don’t bother lifting a finger yourself. It’s all very stylish, but it also means fighting one group of enemies never really feels that different from fighting the next. Happily, the multi-stage boss fights are an exception; here our heroes take on massive monsters and powerful pirate rivals, all with fun patterns, interesting attacks, and wonderful combat-choreography that would feel right at home in One Piece’s anime adaptation. It’s a good thing that the boss fights are so satisfying, too, because the end-of-level payoff helps make up for the fact that getting there isn’t all that interesting. The stages are beautiful to look at, and there’s plenty of visual variety between areas, but in terms of their layout and design, they’re disappointingly indistinct. Whether you find yourself in a sandy desert, a colourful town, or frosty ice floes, you’ll still be wandering around the same basic building blocks of walled paths, corridors, and open arenas, and you can often predict what will happen where with a quick glance at the map: side paths and dead-ends tend to hold treasure, and larger rooms enemy hordes. If you tire of beating up baddies, there are at least a few fun ways to change up the pace, with bug-catching and a surprisingly fun fishing mini-game both represented in levels and Transtown. After you build a Tavern, you’ll be able to take on side-quests as well. These are mostly variations on “Take out so many enemies” or “Find so many items”, a few incorporate more interesting mechanics, like fishing and modified boss fights. You can also spend time customizing your characters with ‘Strong Words’ — secret sentences that you find and earn throughout the game. By equipping these quips and aphorisms, you can adjust stats, gain new skills, and deploy all sorts of battle effects, and the fact that they’re based on quotes makes it a fun system to use — it feels a bit like opening a fortune cookie each time you come across a new one. If you’ve read our review or played the Wii U version of Unlimited World Red, all this is likely sounding very familiar; for the most part, this is the exact same game as the console release. There are a few important differences, however, starting with multiplayer. This portable version unfortunately misses out on the co-op play in Story mode, though up to four players can still take on side quests together in local multiplayer as long as everyone has their own copy of the game. This 3DS version also takes advantage of the touchscreen to display a mini-map and a virtual D-Pad for controlling the camera. Having the map always accessible is a big plus, but the camera control brings up one of this portable version’s biggest problems: the camera simply doesn’t seem optimized for the 3DS’s smaller screen or single-stick setup. The view feels a little too zoomed in to start with — an issue that’s not helped by the cluttered HUD — and adjusting the camera with the on-screen D-Pad feels as awkward as you’d expect. The ‘L’ button centres the view behind your character, which helps quite a bit, but it still feels less than optimal. It’s worth noting that the Circle Pad Pro is supported, however, so having access to that accessory should alleviate any camera issues. Still, missing multiplayer mode and clunky camera control aside, it’s impressive how much the two titles share; this really does feel like playing the Wii U game on the go. In fact, thanks to a well-implemented cross-save feature, you can do just that — a data transfer option on the main menu lets players upload their progress from the 3DS game to the Wii U version or vice-versa, so you can continue your adventure from where you left off on either platform. While it requires a substantial monetary investment, it’s a wonderful feature — the transfer is easy and seamless, taking just a few seconds each time, and being able to check off a quest on the ride to work and still kick back on the big screen with the same save file in the evening feels fantastic. Even on the smaller of those two screens, the game looks great, too; One Piece has locked down a visually distinct style in both manga and anime form, and that carries over to the video game version very well here. A combination of bright colours, subtle cel-shading, expressive character models, and varied visual effects gives Unlimited World Red a look that’s about as close as you can get to the “living-anime” ideal in a three-dimensional game — though the butter-smooth animation ironically outclasses its source material by a considerable margin. Unfortunately there’s no stereoscopic 3D effect at all, and while that feels like a lazy omission in face of the game’s multi-platform release, at least the flat feel is in keeping with the anime aesthetic. Another factor contributing to the title’s high production values is the excellent orchestral score, with stirring and playful pieces alike built around the same memorable recurring motif. It scales nicely along with the action, too; exploring is usually accompanied by incidental music and lighter melodies, while bigger battles and boss fights are backed up with rousing bursts of audio encouragement. Add in the high quality Japanese voice acting — subtitled in cutscenes and interspersed throughout the action — and at times it can feel as if you’re watching the action unfold on Crunchyroll instead of playing it on the 3DS. 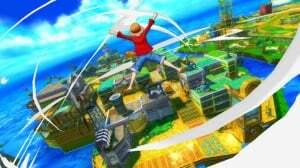 Unlimited World Red is a good example of a licensed game done well. 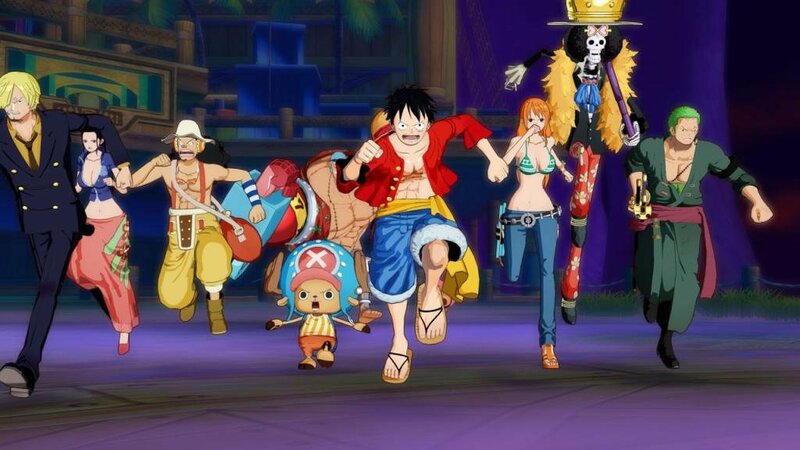 If you’re a One Piece fan, you’ll be in high-seas heaven; the gang’s all here, they look and sound great, and the gameplay — while it has its issues — provides a solid foundation for the adventure. Poor camera controls and some repetitive design dampen the experience, and will be harder to swallow for non-fans, but even players who can’t tell a Straw Hat from a straw hat can enjoy the the bright, high-energy action and colourful characters. I'm a huge One Piece fan, but I usually don't get into games based off anime and manga. Some of them I like such as Astro Boy Omega Factor and the Capcom Jojo Bizarre Adventure game. 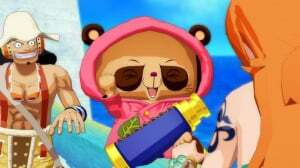 I may look into this One Piece game though. The review is very acceptable. I have had it when it first came out, and I agree with the score. There's a lot of grinding involved too. Fair score and pretty accurate review. I'm on the fence about this game. I'm not a big fan of One Piece (though I do read it regularly in the pages of Week Shonen Jump). But to hear that this is one of the better One Piece games. But then I find out there's no Stereoscopic 3D.... Ugg. Really love the Wii U version. Hope we get games like this from Namco. Really want a Naruto or a Full Metal Alchemists game like this would be so cool to go around fighting. Really surprised it took this long the get a review for it, especially since like the review mentioned, they're literally the same game with the exception of the multiplayer part. Overall good score, I'd give it a 7 too, still haven't bought any of the DLC. Something worth mentioning, if you haven't followed the story, there are some pretty major spoilers(Regarding character deaths), so if you don't want to be spoiled, you might want to catch up to the story first. @Jim_Purcell Oh no! No stereoscopic 3D, the horror! The game is ruined! Hey guys, one question. The 3DS version also has the colliseum mode? That's a selling point to me. Which one should I pick, Wii U or 3DS (or even PS3) ? @simonhwsn It really comes down to which features matter more to you! The 3DS has portability and a handy mini-map (I found myself having to pause to look at the map pretty often on the Wii U version, which doesn't use the GamePad screen for anything other than off-screen play), while the Wii U has easier camera controls, drop-in co-op story, and better graphics. I personally prefer playing on the Wii U, mostly because it feels like a 'big-screen' game to me and it looks great on the TV! (I haven't played the PS3 version, but I assume it's largely the same as the Wii U one.) The Wii U version is also download-only (3DS & PS3 both have retail boxes), so if you're a physical-media-only person, that might not be your platform of choice. Wish I would have waited for a sale. The camera is too hard to get used to. The dpad should be more like Monster hunters. Just give us Super Grand Battle X already! Oh, my goodness! It better not be a Japanese-exclusive. 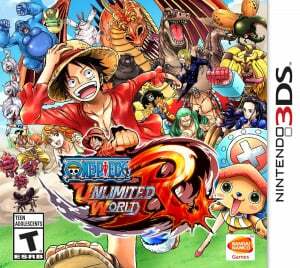 I've been watching One Piece a lot lately, so I think I'll purchase this for 3DS with the spare eShop credit I have. More than a little late given that the 3DS is the lead platform for the game, nice to have a review of it still.